Expanded PTFE sheet material with high multi-directional strength, manufactured by WLGore& Associates using its patented process. Flanges on plant handling aggressive chemicals or high purity media. Ideal for rough or damaged flange faces, where excellent results can be achieved with limited bolt loads. Physiologically harmless in prolonged installation at temperatures up to +260°C according to VDI/VDE guidelines 2480. Complies to FDA 21 CFR 177.1550 (PTFE) requirements for food. • Not subject to ageing – can be stored indefinitely. • Resists all media in the range pH 0-14 except molten alkali metals and elemental flourine. 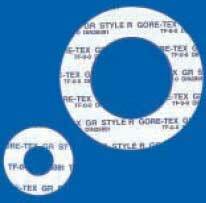 As precision cut gaskets to any shape, size and quantity. In sheets 1.5m x 1.5m maximum. Thicknesses: 1.6mm, 3.2mm.